Back in Bangkok now I already miss the cool breeze that flows through the trees and the sounds of nature. Nevertheless I had a marvelous time today on the way back. We stopped at Chokchai Farm which opened its gates to visitors over ten years ago, but for some reason I had never thought of stopping by. I stopped to get some ice cream, but that was about it. At first impression, when I think of a farm visit pictures of cows roaming about in pastures fill my head. We would probably just have to walk around looking at the cows, perhaps get to touch them a little, and take pictures. It’s hot in Thailand, so when I think of something outdoors I tend to just want to do everything in winter. Farm visits weren’t exactly a priority. 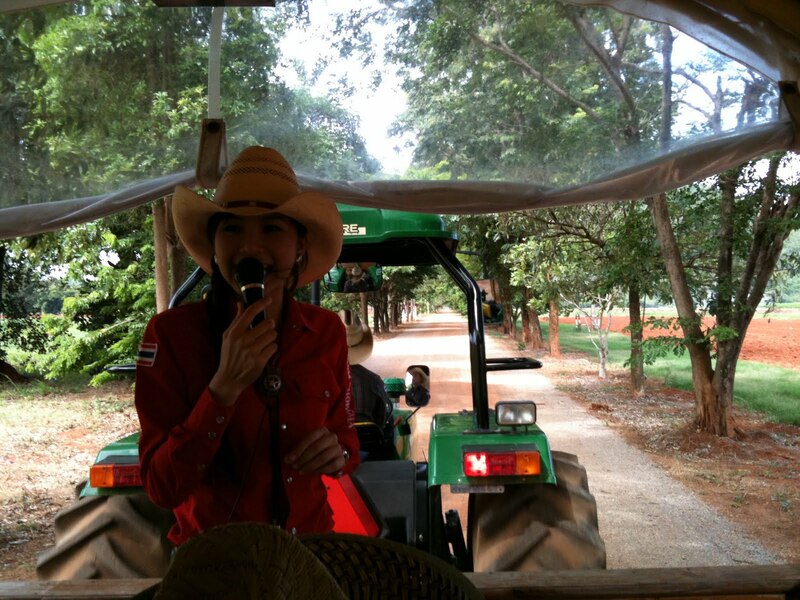 The Chokchai Farm tour surpassed my expectations by far. We started out the tour with a video background of the farm, telling us how it evolved from the seventies, through the oil crisis, survived the Asian Crisis of 1997 before becoming what it is today. 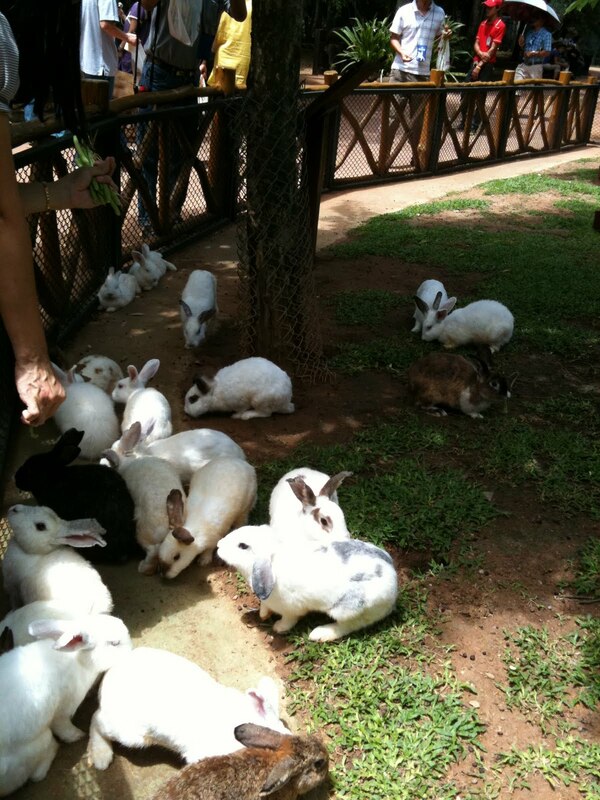 A successful farm in the mountains outside of Bangkok, famous for its milk and dairy products. Well-trained and articulate guides showed us around the farm, pass disinfecting sprays and solutions (to ensure that we don’t contaminate the farm with all our bacteria) , through the making of milk, as well as through farmland and a number of attractions along the way. It’s an experience you have to go through yourself. It can be a lot more fun than you imagined. At this farm, you get to really get a go at being a farm girl. I’ve never milked a cow before and always wondered what it was like, so I jumped at the opportunity to milk a cow when it was offered after the demonstration. It was a lot harder than I thought. Milking a cow requires strength and finger power! Another stop I also particularly enjoyed was the “Petting Zoo.” Deers roamed around freely waiting for you to feed them, baby cows waited for milk, sheep for long beans and rabbits for carrots. You really got to be upclose and personal with the animals. You got to actually interact with the animals instead of just watching them. It was great. I enjoy being with animals. They are really good for the soul. You forget all your troubles and worries. I felt like a child again, but hey sometimes its good to go back to being a child 🙂 Who enjoys being an adult? Later, a herding dog demonstrated to us how sheep were to be rounded up and pushed onto a truck. Wow, its amazing how you can train a dog so well. It brings me back to the movie “Australia.” Vast open spaces require you to be able to round up all the cows on horseback and with the aid of dogs. Wonderful. Who knew a farm visit could be so enjoyable and educational? I didn’t, but now I do 😛 Who’s got milk? hahaha no…it made me not want to eat them actually 😦 Felt kinda sorry for them. Did have milk though….